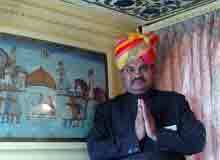 Royal Rajasthan on Wheels is a brand new, Indian luxury train that will begin to chug along from 11 January 2009. A royal experience is what awaits the passengers when they book their journey on the luxury train. The international standards and facilities offered on this train is expected to provide a luxurious travel experience to the passengers. The Royal Rajasthan on Wheels is a joint venture of Rajasthan Tourism Development Corporation and Rajasthan Railways. The 07 Nights/ 08 Days tour on Royal Rajasthan train promises to be a once-in-a-lifetime experience. The additional features such as the super deluxe saloon and the retro lounges are expected to impress the passengers. Royal Rajasthan on Wheels will offer 14 coaches, of which one will be Super Deluxe and the other 13 will be Deluxe Saloons. Two staff cars, two power cars, and two Restro Lounges also form an integral part of the train. This luxury train is expected to offer a seating capacity that can accommodate 82 passengers at a time. The passengers on board can visit the restaurant lounge for their meals and drinks. The two restaurant lounges will ensure that you do not have to wait too long for your food and drinks. The restaurant lounges are expected to accommodate about 120 diners. Royal Rajasthan on Wheels is expected to offer a more luxurious traveling experience to the passengers than what any of the other luxury trains can offer. Only about 82 passengers will be allowed on the train, which is less than what the Palace on Wheels luxury train carries-130. The cabins offer facilities like bed, hot and cold running water, Internet Wi-Fi system, and also an attendant per coach. Extra features offered by the Deluxe cabins include Channel Music and Public Address.